WASHINGTON, September 14, 2017--The Washington International Horse Show (WIHS) is pleased to announce Abigail Brayman, 18, of Charlestown, R.I., was awarded the Lindsay Maxwell Charitable Fund WIHS Equitation Grant. 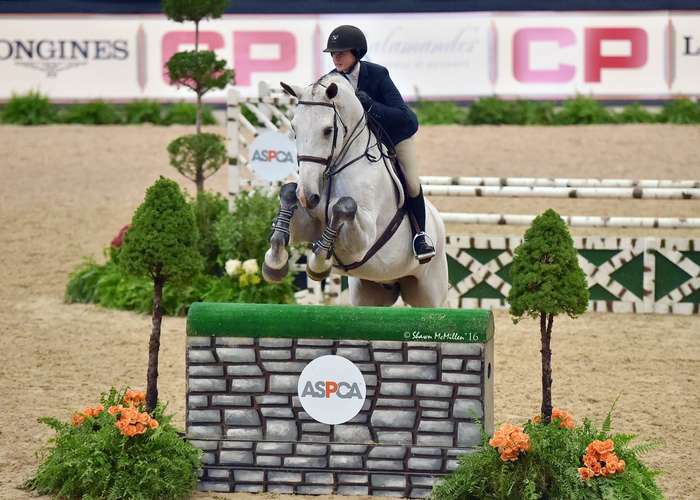 The Washington International Horse Show will run October 24-29, 2017, at Capital One Arena (formerly Verizon Center) in Washington, D.C.
"We are so pleased to be able to award the Lindsay Maxwell Charitable Fund WIHS Equitation Grant to Abigail Brayman," said WIHS President and Selection Committee Member Victoria Lowell. "This is a unique opportunity and WIHS is proud to be part of helping young riders achieve their dreams." The Lindsay Maxwell Charitable Fund, title sponsor of the WIHS Equitation Finals, developed the grant as a special component to its partnership with WIHS. The WIHS Equitation Grant will give Brayman, as the chosen recipient, the opportunity to participate in the Lindsay Maxwell Charitable Fund WIHS Equitation Finals without the financial commitment that accompanies the event. The grant is not strictly monetary in nature, but rather experience-based. Brayman has been a working student with Missy Clark and John Brennan at North Run of Warrenton, Vermont, for two years, following in the footsteps of her older sister, Madison, who also competes on the college-level at the University of South Carolina. Brayman started riding before she can remember as her mother, Wendy, runs Hunter Ridge, a boarding and training facility in Ashaway, R.I. Her father, Matt, is also an announcer and starter at horse shows on the East Coast. She met all of the criteria for the grant, but did not know that North Run's barn manager and assistant trainers had applied for the grant on her behalf. Winning it was a very welcome surprise. "They submitted [the grant application] for me and surprised me with it," said Brayman, who is currently at Oklahoma State University studying Sports Media. "It was really, really nice of them. Winning the grant means a lot. My parents have been so good to me, to let me ride and compete throughout my junior career. It's nice to be able to help them in some way to pay for it." "There was a point in the year where I had to pick and choose because I couldn't go to all [the finals]. This way it's really great that I can go to them all, and [the grant] helps a lot," said Brayman. "She's as good as it gets," said Clark, Brayman's trainer. "She's on time, dedicated, a hard worker, and takes impeccable care of the horses. I don't think anyone deserves it more than she does. She's worked her way through the sport, working and catch riding, and been very grateful when she gets those rides." Of the grant, Clark said, "It's a really nice gesture and acknowledgement of people like Abigail who are in this sport and don't have to unending means to pursue their goals and dreams. I think it's awesome." Brayman has previously competed at WIHS in the pony and junior hunters, but never in the equitation finals. This year, she will be competing with Cassini W, an 11-year-old Holsteiner gelding by Cassini owned by Clark. She and Cassini W made it to the second round of the USEF Medal Final and ASPCA Maclay National Championship in 2016 and won the New England Junior Hunt Seat Medal Finals. Currently standing 23rd in the WIHS Equitation Finals rankings, her goal for this year is consistency to make it to the second round in all of the indoor equitation finals and contend for ribbons. "I'm looking forward to showing in the equitation and watching the bigger classes," Brayman said. "I love that WIHS is in the middle of the city because it gives it such a fun atmosphere." Expenses covered by the Lindsay Maxwell Charitable Fund WIHS Equitation Grant include travel and lodging for the rider and parent, the equitation entry and application fees, a stall fee, two tickets to the VIP platform, and more. Now in its 26th year, the WIHS Equitation Finals is a rigorous three-phase competition held over two days. A panel of three judges test and evaluate the riders in hunter, jumper and work-off rounds to determine the best of the best. Former WIHS Equitation Finals champions include Kent Farrington (1999), currently the #1 rider in the world and two-time Olympic gold medalist McLain Ward (1993), currently #3 in the world (as of August 31, 2017). Other WIHS Equitation Finals alums active in grand prix ranks include Brianne Goutal (2004), a judge in this year's Finals, Jack Hardin Towell Jr. (2006), Lillie Keenan (2010), Victoria Colvin (2015), and Hunter Holloway (2016). Invitations to compete in the Lindsay Maxwell Charitable Fund WIHS Equitation Finals will be sent to the top 40 junior riders based on points earned during the qualifying period in the East Coast and West Coast Leagues with 30 riders invited from the East Coast League and 10 riders from the West Coast League. Qualifying events for WIHS Equitation are held at more than 650 horse shows throughout North America, where riders can earn points to be eligible to compete in the Equitation Finals as well as the WIHS Children's and Adult Hunter and Jumper Championships. The qualifying period runs from Sept. 1 through Aug. 31. For more information, please visit www.wihs.org, join us on Facebook, and follow us on Twitter and Instagram. Tag us using #WIHS2017 and #HorsesInTheCity. The Lindsay Maxwell Charitable Fund is a private, charitable fund. It accepts grant proposals for the benefit of charitable, educational, or scientific purposes, exclusively from tax-exempt, charitable organizations. The issues where the Fund focuses its resources reflect Lindsay's personal priorities and values: improving the lives of children with special needs; enabling access opportunities to education; and providing care, compassion, and protection to animals.